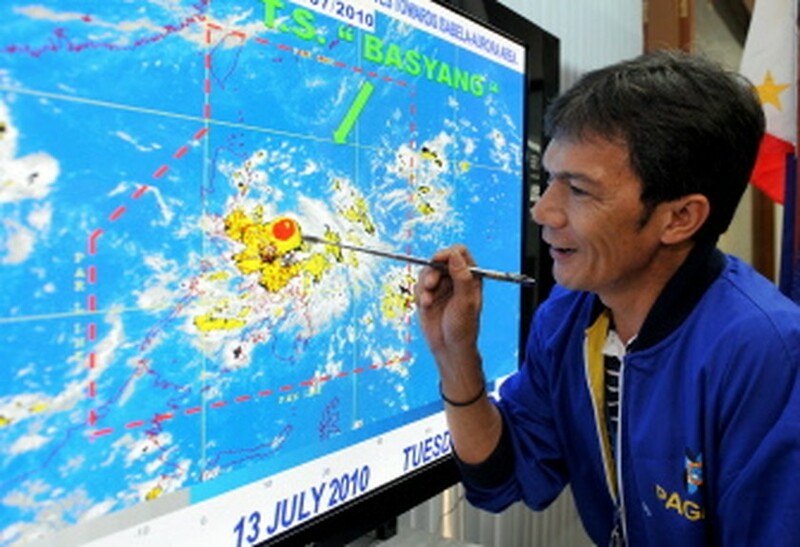 MANILA, July 13, 2010 (AFP) - The Philippines on Tuesday braced for the first typhoon of the year as forecasters warned of floods and possible landslides across wide swathes of the country. Typhoon Conson gathered strength as it moved closer to the main island of Luzon, and would likely hit land Tuesday night or early Wednesday, chief state weather forecaster Prisco Nilo said. "Areas that are in the direct path will experience heavy rains, even areas to the south of the typhoon will have strong rain," Nilo told reporters. "It is possible that there will also be landslides or flooding." Packing maximum sustained winds of 120 kilometres (75 miles) per hour near the centre and gusting at up to 150 kilometres per hour, Conson was Monday bearing down on Catanduanes island on the country's eastern seaboard. It was expected to cut west after that, dumping up to 20 millimetres (0.8 inches) of rain an hour on Luzon before exiting into the South China Sea on Wednesday, Nilo said. "That is a heavy rain," he said. Storm alerts have been hoisted across metro Manila and nearly 30 provinces on Luzon, home to about half of the country's 92 million people, the state weather bureau said. Conson is the first typhoon of the season to hit the Philippines, where millions of people live in slums near waterways and rivers. In August last year, Tropical Storm Ketsana dumped a record amount of rain across the capital, causing deadly floods, and was followed closely by Typhoon Parma which ravaged the rest of Luzon. Aside from killing over 1,000 people, the two storms severely affected the lives of 9.3 million people. The government pledged to move slum dwellers from the most vulnerable areas on the outskirts of Manila, but few have been relocated and could again be severely affected by floods this year. An average of about 20 typhoons slam into the Philippines every year.